People occasionally ask what the connections are between J.V. Jones's first published trilogy, The Book of Words, and her ongoing Sword of Shadows series, and if it is necessary to read Book of Words first. I would definitely say no to the latter point, but here are some of the ways the works are related. Obviously spoilers ahead. First off, they are set on the same world and on the same continent. This landmass is divided into three regions: the oft-mentioned but as-yet unseen and unmapped Far South; the Known Lands, where The Book of Words takes place; and the Northern Territories, the setting for Sword of Shadows. 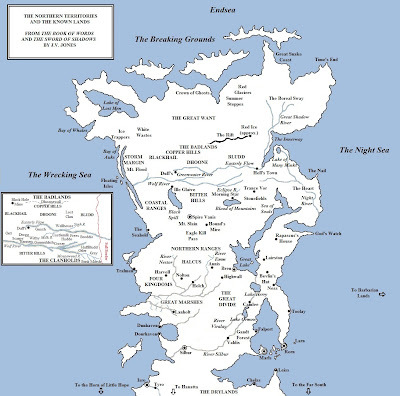 The northern edge of the map in the Book of Words novels is the same as the southern edge of the Sword of Shadows map, and the city of Bren is shown on both. Using this, I assembled the above combined (and very rough) map. The Ranges (known as the Northern Ranges in the Known Lands and the Southern Ranges in the Northern Territories) divide the two areas from one another. According to general usage in the books, it appears that the Far South, Known Lands and Northern Territories are considered subcontinents of the same landmass and they are sometimes even called separate continents (hence references to travellers from the Far South being described as having 'crossed three continents'). There is another continent across the eastern ocean. This is presumably the source of the 'barbarian raids' on Toolay mentioned in Book of Words, and also likely the location of the Sull Far Shore and the Sankang Empire. The locations of the Topaz Sea and Unholy Sea, mentioned in the Sword of Shadows, are not known, so are not shown on the map. Sword of Shadows begins somewhere between sixteen and eighteen years after Book of Words, though the initial prologue takes place much sooner. The series opens with a woman named Tarissa giving birth outside the gates of Spire Vanis. Tarissa appeared in the middle volume of Book of Words as the lover of Jack, that trilogy's main character. It is assumed that Ash March is thus the daughter of Tarissa and Jack. The fact that Tarissa and Jack were (unknowingly) half-siblings and that Jack eventually became a powerful sorcerer is probably why Ash has strong magical powers. Whilst it is assumed that Tarissa died soon after, it should be noted that this is not explicitly shown in the text. Jack's whereabouts during the events of Sword of Shadows - and he'd only be in his mid-thirties - are not known. There is also a possibility that there was an old switcheroo and it's actually Raif who is the child of Jack and Tarissa (due to several curious mentions of Raif not having a true clanhold name), though that might be a bit cheesy. More directly, Baralis, the prisoner of Surlord Penthero Iss in Spire Vanis, was the primary villain of the Book of Words. Baralis was an extremely powerful and amoral sorcerer who tried to conquer the Known Lands by arranging for King Kylock of the Four Kingdoms to take control of the city of Bren through marriage and then conquer the rest militarily. This plan failed when Jack burned the castle in Bren, killing Kylock and severely wounding Baralis. Baralis was taken to safety by his loyal but simple manservant, Crope, but they were ambushed by Iss's men whilst crossing the Northern Ranges. Baralis was imprisoned by Iss for seventeen-odd years, with Iss draining his magical powers to empower his own (much feebler) abilities. For these connections, there are odd discontinuities as well. The Sull, the much-feared non-human race who dominate the eastern coast of the Northern Territories, go completely unmentioned at all in Book of Words, despite their lands lying just north-east of Bren. More bizarre, a powerful sorcerer lives on the eastern isthmus of the continent in Book of Words, north of the mountains, putting him pretty much in Sull territory. This discrepancy has also not been addressed. The real reason, of course, is that Jones likely did not begin planning the Sword of Shadows sequence until Book of Words was completed, and it was too late to go back and adjust some of the earlier books to match later concepts and ideas. Book of Words does make it clear that the northern lands beyond the mountains are inhabited by (relatively) primitive clans, however, and there is regular merchant traffic to them. Whether further connections will arise - and it seems unlikely to me that Jack would not eventually learn that he had a child and would not go in search of it - in remaining one or two volumes of Sword of Shadows remains to be seen. The discontinuities irk me. I'd like to think there is something behind them, but I suspect its author sloppiness in her style sheet.